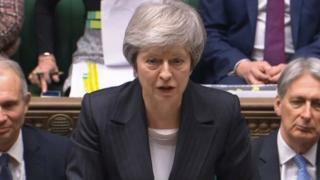 Theresa May has been accused of "misleading Parliament, inadvertently or otherwise" as the full legal advice on her Brexit deal was published.The Scottish National Party said the PM had "concealed the facts" after the advice, which warns of an "indefinite" backstop deal with the EU.Ministers were found in contempt of Parliament on Tuesday for only publishing an overview this week.But the PM said the two documents were consistent and the position was clear.In the six-page letter, dated 13 November, Attorney General Geoffrey Cox said the proposed backstop arrangement with the EU to prevent a hard Irish border could "endure indefinitely". The UK, he said, would not be able to "lawfully exit" the arrangement without a subsequent political agreement and this could lead to "stalemate".Ministers agreed to publish the advice after being found in contempt of Parliament by MPs on Tuesday, in one of a series of Brexit defeats for Theresa May. Mr Cox published a legal overview of the repercussions of Mrs May's Brexit deal earlier this week but argued that disclosing the full advice would compromise client confidentiality and be against the national interest. Labour and other opposition parties said ministers had "wilfully" refused to comply with a binding vote in the Commons last month which demanded full disclosure. What do the Commons defeats mean for Brexit"Despite statements that it is not intended to be permanent… in international law the protocol would endure indefinitely until a superseding agreement took its place," he wrote. "In the absence of a right of termination, there is a legal risk that the UK might become subject to protracted and repeated rounds of negotiations. ""This risk must be weighed against the political and economic imperative of both sides to reach an agreement that constitutes a politically stable and permanent basis for their future relationship. "At PMQs, the SNP's Ian Blackford said: "Is it time that the prime minister took responsibility for concealing the facts on her Brexit deal from members in this House and the public? "Will she take responsibility? "The PM told MPs that she had made it clear that the UK could not unilaterally leave the backstop plan, so had not been at odds with the legal advice, which made it clear the UK wad no sovereign right to withdraw.But she insisted that it was an "insurance policy" that neither side want it to come into force and was only intended to be a "temporary" arrangement. Labour said it showed the "central weakness" of the PM's Brexit deal.